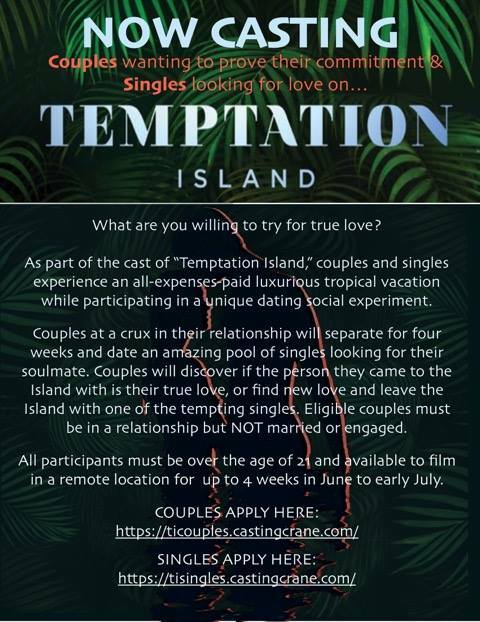 The show is now casting for a new season and there is a casting call out for couples that want to prove their commitment to each other once and for all, as well as singles who are still looking for love. What are you willing to do for true love? 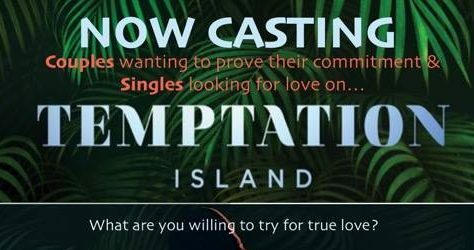 Those cast on Temptation Island will get an all expense paid vacation in the tropics where they will participate in a unique dating social experiment. The show’s casting team is currently looking for both couples and singles. This guilty pleasure features four unmarried couples from across the United States who travel to an exotic locale to put their relationships to the ultimate test (i.e. get it on with the 15 eligible men and 15 eligible women put on the island to break up the unions). Over this period, the couples get the opportunity to answer questions about themselves and one another, and to find out if what they think they want is actually what they do want. Couples cast for the show will separate for 4 weeks and date an amazing pool of singles who are on the show looking for their soulmate. In the process, couples will discover if the person they came on the show with is in fact their true love or find that maybe one of the singles on the island suits them better. At the end, couples will choose to either leave with the person they came there with or possibly leave with the person they met on the island. Couples who would like to be considered must be is a relationship, but not married or engaged to be married. Please see the casting flyer below for more details.